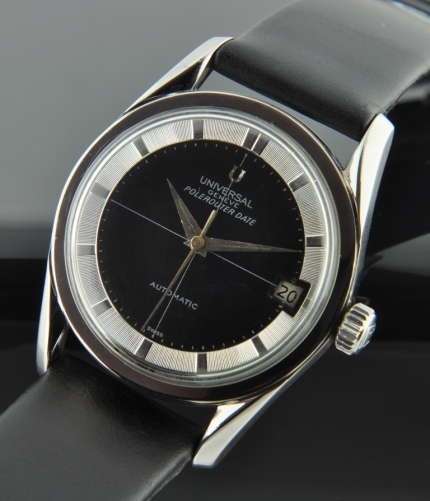 This vintage 1960’s UNIVERSAL GENEVE POLEROUTER is a very stunning watch on the wrist! The steel case measures 34mm. and has the “bombe” style (inward turning lugs). The restored two-tone dial; having jet- black glossy middle and raised, ridged, silver outer edge along with original Dauphine, pitched hands looks excellent. The micro-rotor automatic winding UNIVERSAL GENEVE movement is keeping excellent time after a recent cleaning. Notice the eccentric date aperture.